Twenty-four hours before the approximate onset of MSP's first measurable snow, most forecaster were expecting roughly 3 inches of snow to fall in the urban core. The following information was what we were able to gather online at 7:30 p.m. on Monday night. WCCO: Snow on yards. Roads mainly wet. 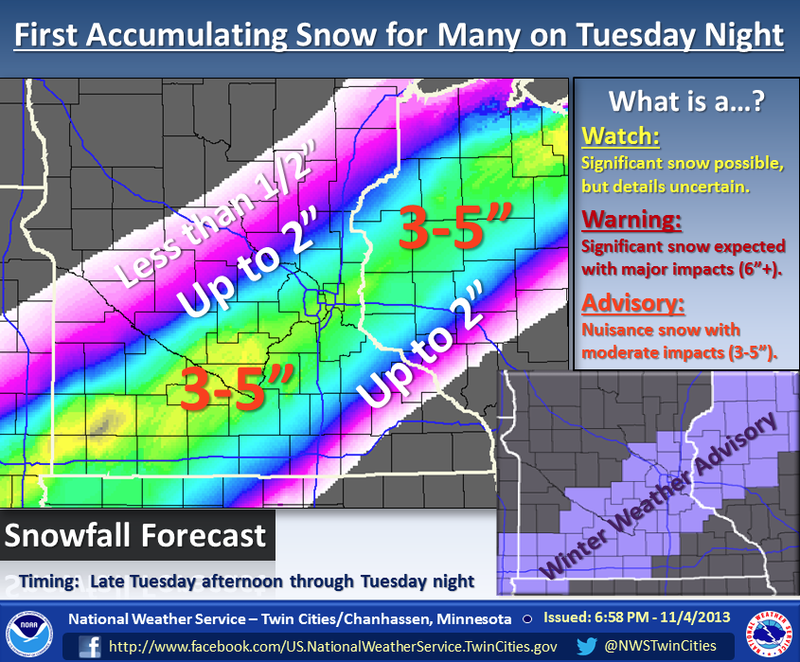 Showed urban core of MSP split between 1-3” band and 3-6” band. KSTP (kstp.com) Here in the Twin Cities we'll probably end up with 2 to 4 inches of snow before it winds down early Wednesday. This should make the roads slick, especially the side streets, for the Wednesday morning commute. KSTP. No recent information or video posted on website. KARE11 (kare11.com/weather/) Potential of 3-5 for Twin Cities. MPR (http://blogs.mprnews.org/updraft/) 5:25 p.m. posting. Most of the metro will probably end up in the 1 inch to 4 inch range for snowfall by Wednesday a.m. So Paul Douglas's update is showing us the NAM model, so is he basing his forecast off of that....seems to me he is, or if its a bust he will say I was just going with full disclosure and showing you what one model has to say.....if the NAM verifies there will be alot of crow eaten because what Paul Douglas shows and says is the area just north of Rochester to Eau Claire will get a foot but their not even in a winter weather advisory......why even show that model on your blog if you dont believe what it is saying...obviously he believes it in my opinion. First snow of the season! Big Daddy, where is everybody?? They are still calling for a general 3-5 inch blanket here in the southern and eastern burbs. The clouds have moved in rapidly in the past hour. The ground is covered in a heavy frost. We were in the lower 20's this morning in the Lakeville/Apple Valley area. It's November. Let's bring on the snow and get this season started! - Temps reaching into the 40s this pm will guarantee a rain/snow mix at first. - Storm is fast moving. - Little evidence that a trowal/deformation axis will develop. - Can't find an obvious mid-level low. All of this points to a minimal snowstorm at best. I could see a swath of 2"-5" of snow across MSP & a good chunk of so. 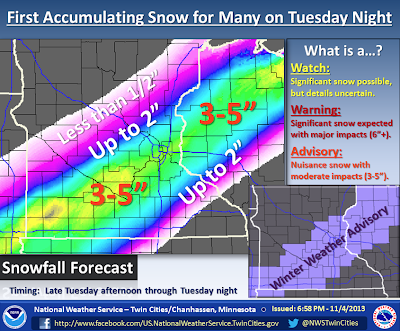 MN, but amounts above 5" will be few & far between. Hmmm...latest model (and Paul Douglas) is pushing most of the snow south with the north/west suburbs getting little-to-nothing now. I expected this trend as of last night, but the radar has already lit up in Wright County, which would counter the models. Is dry air expected to eat away at it quickly or is the snow setting up further north than anticipated? Kudos to most mets not making a big deal out of this storm, but at the same time, kinda underperformed didn't it? I will not even have to pick up a shovel in Minneapolis. Officially at MSP 2.2" although really no significant accumulation on roads as it was to be expected after a day where temp had been in the mid 40s. Overall slightly underperformed, or over-forecact. Not clearly a busted forecast, maybe a semi-busted forecast for MSP? @Bill wasnt the official snow tally at MSP 2.2?....just curious why u said 1.1 on your Twitter account, anyways I believe the snow under performed and over performed depending where you live in Minnesota, for instance the metro core didnt get the 3-5 forecasted by the NWS but the St. Cloud area did and they were forecasted to get no more then an inch, likewise in SW MN no one forecasted warning level snows there and thats exactly what they got......so definitely some misses but thats what we have come to expect with winter storms they are fickle right up to the last minute. I'm just glad to see my buddy, snow, back......and as a weather enthusiast always looking looking out over the horizon for whats next and it looks like the first part of next week will offer us some more snow and I think this time around if we get the snow it will be a better accumulation because temps look really chilly to support snowfall next week.....we'll see what happens, but I can tell you seeing the white stuff earloer this year is good for business. I saw Twitter mentioned in here, so I thought I would just throw this out there. I'm on Twitter as well under the handle @dewppler. It is a personal account that is mostly about sports, weather, or just completely random funny BS. The name on it is Storm Chaser because I want to make sure I keep that account completely separate from my work one. You are more than welcome to follow me on there, since I do tweet on there about incoming systems and post graphics from time to time as well. The storm behaved a lot like some thought it would. Given the warm ground temps, slower change over, and many other factors, it was mostly just a bleh system locally. Southwest MN hit the jackpot with this one (funny they weren't even in the watch to begin with, but that falls with Sioux Falls office, not Chanhassen). A good warm up system to try to get the winter season started. Models have been pretty flip floppy in the long term on pushes of cold air and potential storms. Early next week looks cold, but after that is just a big question mark. GFS spins up a big storm 10 days out, but that's the only model at the moment that does it. For now, get the leaves raked up and the yards clear, because it's only a matter of time before everything is covered in snow until April or May.